The czars are buried here and, frankly, by the time we got here, I thought I had seen enough of both churches and czarist history. But this turned out to be a highlight capped by a brief concert by an a capella quartet of priests. Very emotional place. Saw the burial spots of the Russian Czars. Hugely interesting visit to the burial sites of the Russian Tsars. GReat opportunity for seeing some of the city. GReat opportunity for seeing some of the city. The fortress itself is interesting but it is the church containing the Romanov family which is the crowning glory. Just breathtaking. Fatastic opportunity to see where it all started and the final resting places of the Russian Tsars and their families. Very cool buildings. There was a band playing music to the square below while we were there. Another long day filled with exciting history, buildings and art. Part of our tour. It was as good as expected for another baroque church. To see the tombs of past tsars was interesting. Long 2 days but well worth being a bit tired. The day was so packed, and there were so many traffic snarls and cruise ships in port that we were afraid we would not get back to the ship on time. we saww it jut from out. we saww it jut from out. beautiful exterior, i suppose something for me to go back for. Beautiful, very interesting, well worth the hour stop. It was educational and a good start of our tour. Excellent and our Tour Guide, Elenna, was very informative. Interesting tour of the church and we also enjoyed a short performance of the choir. Excellent tour exploring the prison and the Cathedral, followed by a short river cruise. Easy walking thru beautiful gardens and church. You need to be with a guide or apply for a visa to tour on your own. Beautiful fortress. 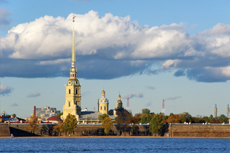 It was built for protection by Peter the Great in case of an attack by the Swedes. Many of the Russian tsars are buried here.